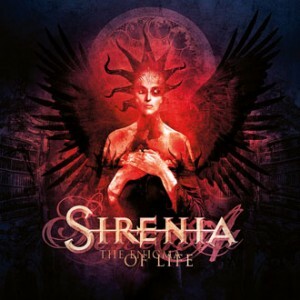 "The enigma of life" is the fifth album from Sirenia. It features the same vocalist as on their previous album, "The 13th floor", Ailyn - making this the first time a Sirenia vocalist has lasted longer than one album since ex Tristania founding member Morten Veland founded Sirenia. As a big fan of this genre of music I was looking forwards to hearing this album, and at first it seems to tick all the right boxes - a talented singer, some great guitar work, and symphonic arrangements, but the more I listen to the album the more it feels to be lacking something. To me the album just feels to be lacking depth and power - even the heavy opening of "All my dreams" feels slightly flat and subdued, as though the mixing process cut the levels down too much and robbed it of its power. Morton Veland actually does everything on the album apart from Ailyn's vocals - he plays all the instruments and produced and mixed the album, so the blame has to lay with him. I think with a different producer then the album would have had more chance of living up to its full potential - with Morten mixing and producing the album lacks the fresh input of someone who wasnt so intimately involved in writing and recording the album. I would like to hear Sirenia performing the songs from this album live in concert as they will then hopefully have more of the power and variety that is missing in the album. A good album but one that fails to live up to its potential and to peoples expectations, and which fails to stand out among the competition.